The Mediterranean is the undisputed homeland of the Olea europaea olive variety. Together with wheat and wine, the olive forms part of the gastronomic triad that has always been part of the diet of different Mediterranean populations. It has had a fundamental effect on the development and progression of the civilisations both commercially and symbolically: its branches have been associated with glory, with peace, and with abundance. In the Parthenon, the sculpture complex of Phidias puts the olive tree at the centre between Athena and Poseidon. In fact, according to Greek mythology, the goddess Athena planted the first olive tree on the Acropolis as a symbol of victory over Poseidon, and from that moment on, she became the patroness of olive groves, and the Panathenaic Games were dedicated to her. Since ancient times, olives have played an essential role in the diet, religion, medicine and cosmetics. At that time, olive growing developed in the eastern Mediterranean basin, in areas such as the Fertile Crescent, south-west Turkey, Syria, and the Palestine, and took root in Greece and its islands. The Philistines, Egyptians, and Cretans prospered thanks to farming entire areas of olive groves, and there are innumerable accounts and historical evidence to verify this. For example, the stone mills preserved in the Museum of Olives of the Sheman Industries in Israel represent extremely important evidence, and confirm that oil production in those lands dates back to the fifth millennium BC. In Egypt, a tomb fresco of the pharaoh Ramses III, depicting the typical stirrup jars containing ointments and dating back to the second millennium BC, shows to what extent olive oil was valued in the cosmetic practices of the time. Furthermore, on the tomb of Tutankhamen (1341 BC – 1323 BC) there are olive leaves and branches, and finally, the enormous cisterns and the big goat leather wineskins, as well as other artefacts preserved in the Olive Oil Museum of Kapsliana Arkadi, prove that the oil making tradition in Crete existed as far back as the Minoan age. Although the global primacy in olive oil production is currently held by the countries of the western part of the Mediterranean, with Spain’s annual production exceeding one million tons, Greece holds a role of primary importance, and its production will easily beat that of Italy due to the negative trend in 2016/2017. In actual fact, with an annual average of four-hundred and twenty thousand tons, it was the number two global producer of olive oil in last season. The farmed area of olive groves covers around one million hectares with no fewer than 150 million trees (80% of the cultivated plants), occupying 23.5% of the cultivated land, which it should be noted, has a rather uneven topography. On the island of Crete, the entirety of which is recognised as a protected designation of origin, olive growing has demonstrated a strong upward trend in the past 40 years: there are 35 million olive trees, with a production of 120,000 tons of oil. Olive groves in Crete cover around 64.2% of the total farmed area, with olives making up 86% of the tree crops, two-thirds of which are in the hilly and mountainous regions. 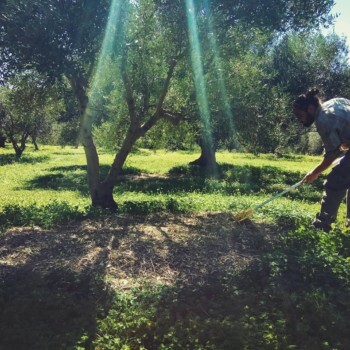 The olive groves in Crete are farmed both on poor, mostly rocky terrain, with relatively low precipitation predominantly during the winter months, as well as on the fertile flatland close to the coast. The farmers in the coastal regions generally use nitrogen and potassium-based fertilisers to maintain the fertility of the soil. Additionally, the land is ploughed around March and the end of April, both to eliminate the natural vegetation as well as to facilitate the conservation of meteoric water at the end of the rainy season. Normally, the second round of ploughing takes place at the end of the rains. Another method in general use involves leaving the olive groves uncultivated, using only herbicides to control weed growth. This depends on what level of humidity loss is permissible, and the degree of competition for water between the olives and weeds can be tolerated. When considering cultivation on sloping ground, land conservation practices help improve the utilisation and conservation of rainwater, simplifying agricultural practices and minimising soil erosion. Terracing is the most widespread practice for soil conservation in traditional olive groves, but the soil has been gradually degrading since the 1960s, and replaced by new olive groves planted on the terraces built by bulldozers. With this method, the sloping angle is turned inwards, while the distances between the terraces vary from six to eight metres depending on the soil profile. The main olive varieties present on the island are Tsounati, Koroneiki, Mavrelia and Chondrolia. One of the most important representatives on the island is the olive tree of Vouves, in the village of the same name in the municipality of Kolymvarinella. Kolymvarinella can be found situated in the region of Chania, which is estimated to be at least 3000 years old, attracting 20 thousand tourists every year. Examining the results of the numerous surveys conducted among the population of the island of Crete, Ancel Keys noted that there were quite a number of centennials among the farmers and that their breakfast normally included a glass of olive oil. The story of Christina Chrisoula is a fascinating one, typically Mediterranean, and is based on a long journey that has led her to revisit the places of her childhood and the traditions of her beloved Crete. 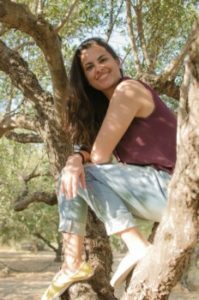 Born in 1986 and raised in Ierapetra, she comes from a family that has always been dedicated to olive growing and oil production for personal use. At the age of 18, she moved to Corfu to study foreign languages, translation and interpreting at the local university. She has travelled extensively, both during the studies and later on, living in countries such as Ireland, France and Spain, before becoming a project manager at an Athens-based translation agency. She speaks fluent English, Spanish, and French, and dreams of finding time to also learn Italian. But more than anything else, Christina wishes for the quality extra virgin olive oil to become generally affordable to all, which is why she decided to return to her beloved land and become an established producer. How did you become passionate about travelling and your job as an interpreter? I have always been keen to discover the “other”, the “foreign”, to understand what makes us different but at the same time – and more importantly – what characteristics we have in common as people that bring us close to each other. In Athens, I started working as an intern and eventually became a Project Manager. I worked there for seven years and, looking back, I feel really lucky because working in that company taught me what professionalism means. Thanks to this experience, I learnt to work in a way that meets international standards, to take on projects and complete them successfully, resolve problems, and assume responsibilities. More than anything else, I learnt that attention to detail, consistency and quality always pay off. What are your hobbies? What do you enjoy doing? Naturally, I love good food, I adore dancing the tango and listening to the Spanish guitar. I like reading and Nikos Kazantzakis is my favourite author. 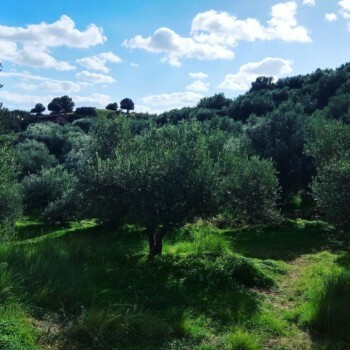 Obviously, I enjoy spending my time in our olive groves, I love going hiking and, as much as I love mountain climbing in winter, I cannot live away from the sea! What took you back home? I believe it was destiny. No matter how far my steps took me, I have always been looking back to Crete. It is a very special place that keeps its traditions alive, and the influence it exercises over its people is very strong, like a magnet, and it defines to a great extent who we are. It is an island with a long history and rich culture, but also with a great landscape and biodiversity. 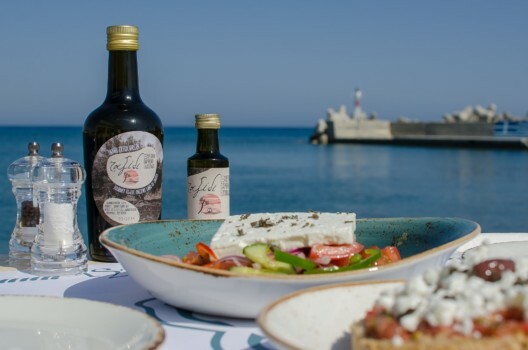 Surrounded by the Mediterranean Sea, it offers its people its products in abundance. Obviously, this attraction is also due to the bond that I have with my family. My sister Anthousa and I, and my two younger brothers, Yiorgos and Antonis, have always participated in olive harvesting, initially with my grandparents and then with my parents. My memories are filled with the scents of the festivity that would form in the company of others, and the joy of taking the harvest to the mill. This close contact with the land and our olive trees, the smell and the taste of the fresh olive oil is deeply engraved on my heart and mind. 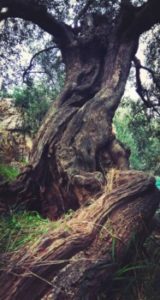 Looking back, all the memories I have as a kid are of me playing underneath, hanging from or hiding in the centuries-old olive trees. What made you change your career? As I mentioned before, it was going back to the family roots, to our origins and my love for the olives. But many other factors contributed to this decision, with the ongoing economic crisis in Greece being one of them. Although not personally affected, my brother Antonis, who embraced the project with me, and I came to see that returning to the land and the agricultural production was the only way out. I might be optimistic, but I do believe that gradually more and more young people have started to realise this. Why did you decide to become an oil producer? After I returned, we decided to acquire more olive trees and take our family production to the next level: bottle our very own extra virgin olive oil. We have always shared the surplus with family friends and relatives, so why not make it available to other people as well. We wanted more people to be able to have this unique product on their table, a product whose history is lost in time, one that we have been enjoying in our family since time immemorial. We wanted more people to be able to profit from the proven benefits olive oil has for our health. I also believe that everyone in the food business, regardless of his or her role, should ensure that the general public is well informed about the importance of a healthy diet. With my family, we aim to produce a top quality, affordable extra virgin olive oil that parents will include in their kids’ diet every day. We believe that food, and above all nutritious, quality food, is a common commodity that should be preserved. Food culture is very strong in Crete. The table has always been the central pillar around which family, friends, and the community would gather. The table, and the food on it – prepared with love, even with the most humble ingredients – is an open invitation to the next person, it is communication, hospitality. We want our olive oil to be at the centre of this gathering. Above all, it is my very personal search for well-being and happiness: contact with nature has always had a surprising effect on me. When I decided that I wanted to do something creative, I automatically thought of our olive groves. Working the land is something that has always made me happy. As I mentioned earlier, I grew up in Ierapetra. However, my family’s roots are in another town of east Crete, Sitia, and more specifically in Zakros, a small village at the very eastern end of Crete. This is where our olive groves grow – an isolated little place, just a dot on the map, yet a place of particular wild beauty and history, where the land of Crete dives into the Mediterranean Sea in the east. It is a harsh and unfriendly land at first sight, but very generous to those who will take care of it and cultivate it with love. Olive growing and olive oil production have been linked to the life of east Crete and Zakros for over 3500 years. In 1961, excavations at Kato Zakros brought to light the Minoan Palace. It was a harbour of great importance for Minoan Crete; commercial ships loaded with raw materials and agricultural goods left here for Cyprus, Egypt and the Middle East. No less impressive is the fact that during the excavations, a pot with preserved olives was found, as well as a stone mill that was used for the production of olive oil. What variety do you cultivate? The whole region of Sitia is an olive oil production area, awarded for its quality. Therefore, it comes as no surprise that the majority of people in Zakros are olive growers, with olive oil being their main source of income. The variety we cultivate is Koroneiki, which is the most widespread variety in Crete and Greece in general. The Koroneiki olive gives superior quality oil, with fruity aromas and well-balanced bitter and pungent notes of medium intensity. The altitude of Zakros, at 300 m above sea level, its microclimate, its soil and the well water irrigating our olive groves, all contribute to an excellent olive oil of ultra-low acidity. Additionally, since our winters are mild, this variety poses zero risk. This is why we grow the Koroneiki variety; it is ideal for the warm and dry climate of southeast Crete, and it does not require very low temperatures to be able to blossom. 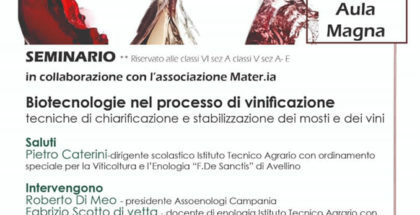 To ensure the quality of our product, we apply all the appropriate processes at every stage: from harvesting in a timely manner and taking the olives to the mill within a few hours of harvesting, to pressing them at low temperatures, to ensuring proper storage conditions with no contact with oxygen and sunlight. 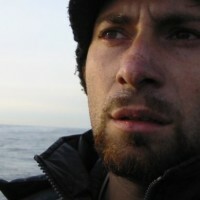 In the field, our philosophy is to intervene in nature and its processes as little as possible. We are shifting gradually to organic and regenerative farming. Our two first goals are to create healthy soil that will nourish our trees and ensure the best possible use of water, and at a second level to convert our olive groves to healthy and sustainable ecosystems. Unfortunately, the practices of past generations have led to degradation of the environment. Fertilisers and chemical-intensive farming have caused considerable imbalances in nature. We strongly believe that doing the least possible harm is not enough anymore. We are at a point where we should help nature regenerate itself. And young farmers have a crucial role to play in this. We believe in small-scale production units that take care of the environment, in doing business in an ethical manner, and that we should act as ambassadors for the local cultures. That is our guiding idea. After attending professional seminars concerning the production of superior quality olive oil, olive oil tasting, and marketing, we began building our virtuous and ethical business model. In everything we do. We seek the beauty that is hidden in everyday, simple things. I think my grandfather Yiorgos was the person who inspired me the most in this aspect. He was a simple man, with a heart full of beauty – like most of the people of Sitia and Crete in general. 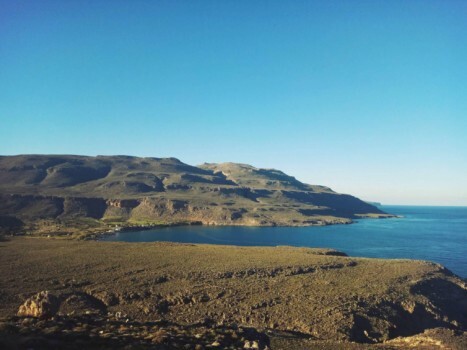 They say that the environment that surrounds you shapes you, and Crete is a beautiful land. My grandfather taught us – through his life and way of doing things – that one can create beauty with the most humble of means, in the moments of life when you would least expect it. As I grow up, I believe more and more that wisdom comes from simplicity. I also believe more and more that the secret to happiness is having your heart and your home open to others, giving without asking anything in return and leaving behind something beautifully done, no matter how big or small. Last year you produced the first official bottle. What did you call it? How did it go? As it was the first year we bottled our olive oil, we had to overcome many obstacles and find solutions to various challenges. It was a demanding process that allowed my brother Antonis and me to demonstrate our problem solving capacities, and to adapt and find the best possible solutions. However, our persistence and patience did bear the fruit we hoped for. And that is why we decided to call our first bottle Taxidi. Taxidi means journey in my mother tongue, and as the name suggests, our extra virgin olive oil is the product of a continuous and arduous process into which we have poured our souls and dreams. Just as you would when facing a new journey, we ruminated on the best path to take. We overcame so many obstacles with our eyes always looking ahead, reaching one milestone after another, while being aware that every year is a new challenge and that we always must give our best to reach our goal. Just as in a cyclic and perpetuating journey, we had to follow nature’s lead to be able to describe the new harvest. 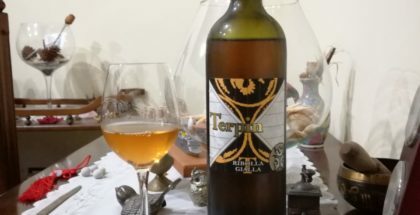 Taxídi is an EVOO with excellent chemical and organoleptic characteristics. 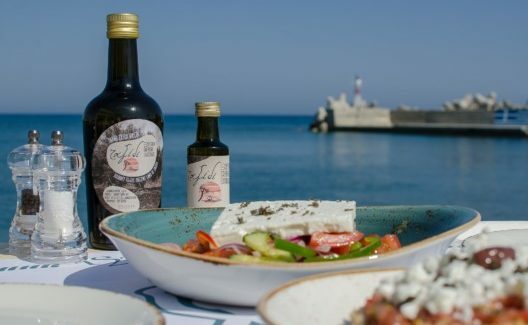 Its extra low acidity of 0.29% and its balanced sensory profile make it a premium quality extra virgin olive oil that adds its special flavour to every dish it accompanies. We achieved this result because this first year we opted to harvest our olives at the very first stages of maturity, during the phase when the exterior of the fruit begins to change colour from green to light purple. This retained the green and fruity aromas that koroneiki gives and at the same time preserved the less intense well-balanced bitter and pungent sensation. 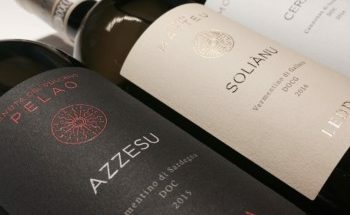 What we got is an extra virgin olive oil with fruity aromas of green grass, banana, and green pepper of medium intensity, with notes of citrus and herbs that leave a sweet finish in the mouth. My dream is for our olive farms to become a meeting place for people who care, who want to learn, who wish to come in contact with other cultures, experience unique moments and create memories that they will take away with them. I would love to create unforgettable memories in the hearts of those who come to visit us, so that they may, like me, always hold Crete in their heart.